Gallstones develop in the gallbladder. Usually the gallbladder resides in the right upper abdomen near the rib cage. The function of the gallbladder is to concentrate bile produced by the liver and store it for the next meal. Gallstones can produce a variety of complications. They can produce obstruction of the neck of the gallbladder causing distention of the gall bladder. Due to the gallstone, the gall bladder can get infected and become gangrenous and may even perforate in the abdominal cavity causing serious life threatening infection. The gallstones may also travel down to common bile duct producing obstructive jaundice and gallstone pancreatitis. Signs and symptoms of gallstones include right upper abdominal pain, and near the right upper back and shoulder blade. The pain typically comes up after eating a fatty meal. 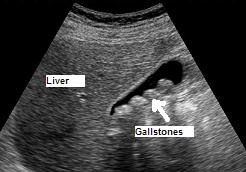 The gallstones are identified by Ultrasound examination of the abdomen. Laparoscopic Cholecystectomy: Best treatment for gallstones, when identified and before complications of gallstones occur, is the Laparoscopic removal of the gallbladder. This is an outpatient surgical procedure. Patients typically go home the same day after surgery. For years surgeons like myself used to admit patients to hospital for surgery, make a 6 to 9 inch incision in the right upper abdomen and take the gallbladder out. This required the patient to stay in the hospital for 3 to 4 days and also away from work for 6 weeks due to longer recuperation period. For the past 19 years I have used this technique; Laparoscopic Cholecystectomy. Usually I would make an incision below or above the umbilicus and achieve pneumoperitoneum. I would then make 3 more small incisions to work through and remove the gall bladder via the umbilical incision. This requires my patient to stay in the hospital for 6 hours and are able to go back to work in 5 to 10 days. For more information click here. If you suspect that you or someone you know have gallstones please make an appointment in our office by calling (559) 782 8533 for further evaluation and management or call your doctor for a referral.